What happens when you mix the first name in roleplaying videogames with the first name in animation? 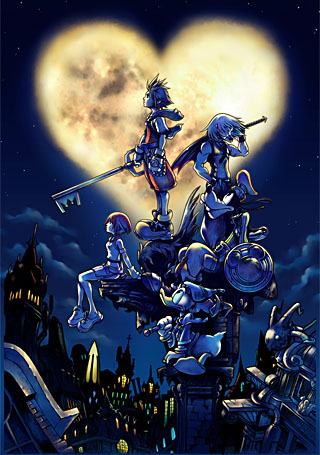 Something wonderful, as Squaresoft and Disney have proved with their joint venture, Kingdom Hearts. When a supernatural storm transports 14-year-old Sora to a distant land, he sets out to track down his missing friends. Teaming up with Court Wizard Donald and Captain Goofy, join Sora as he embarks on a valiant quest to find his friends and defeat the evil "Heartless." The game is an excellent piece of programming, throwing away Final Fantasy's cumbersome turn-based combat for a more fluid, realtime platform experience. As you travel to different worlds, you meet and interact with more than 100 Disney characters drawn from throughout the company's history. The graphics are top-notch, immersing you in a 3D cartoon world. But enough about the game - this review is about the toys! The Kingdom Hearts line comes to us from Toycom and Mirage toys. Who are Mirage? Well, they used to be WB Toys. Then, before they released anything, they changed their name to N2 and gave us The Matrix and Mad Max. They then turned out the abominable Tick figures, a line so poorly received that it supposedly prompted this newest name change. Not the best track record for a company, is it? While a lot of fans hated N2, I really liked their Matrix figures. As I've said before, N2's Matrix figures are better than what McFarlane has shown us so far. But no matter what you thought of their older offerings, Sora and friends are the best things they've released yet. Released in two-packs, each set of figures includes one Disney character and one videogame character. This was a good choice on their part, and keeps Square's creations from becoming the pegwarmers they otherwise would have been (not because they're bad figures, but because they'd have to compete with legions of Disney fans). 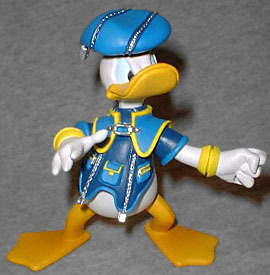 This set includes Donald and an Air Soldier, the flying Heartless. One of the cooler parts of the game is the costume design, which has given Donald an entirely new wardrobe while still making him look like his classic, sailor-suited self: blue cap with a slight tail, blue shirt, no pants. Of course, the clothes aren't exactly the same; with a few zippers and pouches, he looks much more like a Final Fantasy character than a simple cartoon. The character inside those clothes is the same Duck we've always known; Mirage's sculptors did a great job from head to webbed toe. His bill turns up slightly, and he's got an angry look in his eye. His (four) fingers look like the pointed feathers that he's always had at the end of his arms, and his big yellow feet are, well, big and yellow. Donald is articulated at the hips, waist, shoulders, sleeves, wrists and neck. Ten points of articulation on a figure like this isn't bad at all. Donald's a short little guy, so he stands just under 3⅜" tall. You can get him in some decent spellcasting poses with all that articulation, and he does include a wand which shows off one of the game's other strong points: cameos. While the Disney crew get the spotlight, Square brings its own toys to the sandbox. If you've played Final Fantasy games before, you're likely to recognize Cloud, Squall or Aeris when they show up. But not everything is so blatant. You can upgrade your weapons as you move through the game, and the most powerful wand is the Magus Staff. On the end is a tiny little Black Mage head, looking for all the world like Orko. In addition to being split between Disney and game characters, each pack also includes one hero and one villain. Donald's enemy is the flying Air Soldier, which first shows up in level two of Traverse Town. The little flying Heartless looks really good, his little bodysuit covered with the appropriate wrinkles. He wears a leather aviator's cap with a pair of goggles resting on top. He has big thick boots, arrows on his knees, hexagonal bracelets and brown claws on each of his eight fingers. He's even got that Heartless emblem on his chest. So evilly cute! 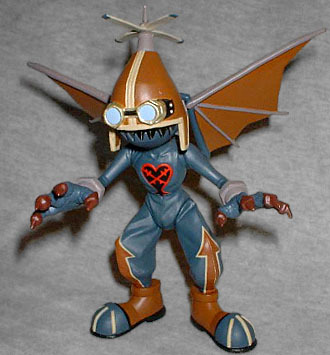 The Heartless stands 4¾" tall at the top of the tiny movable propeller on top of his hat. He moves at the ankles, hips, shoulders and neck. He also has a nearly 7" wingspan, and each leathery wing has two articulation points of its own, bringing the Air Soldier's total up to 12; not bad for a cartoony figure. The only drawback to these sets is their price; for two 5"-scale figures, you're paying nearly $15. While these figures are nice, I can't see myself buying many of the sets. As it was, if I didn't really like both Donald and the Heartless, this would still be on a shelf somewhere. It's good to see that N2 has made something of themselves, but wait for clearance.